Windows has mechanism that allows applications to create pending file operations. 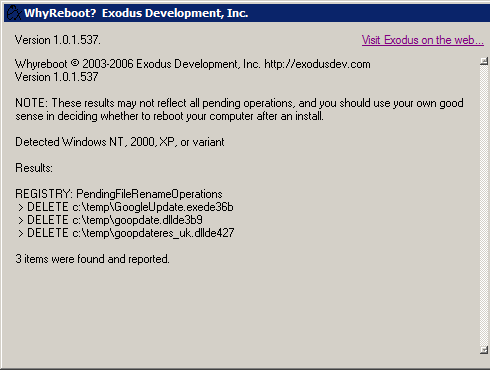 Such operations (moving or deleting file for example) are postponed and executed next time computer is rebooted . This is mostly used when files are locked and can’t be processed while Windows is running. WhyReboot is utility that shows list of currently scheduled pending operations. Really simple. It accesses Windows registry section where information needed is stored and displays it as text. Simple, effective and way more user-friendly than manual digging in registry. deal with files manually using Unlocker or FileAssassin to skip reboot. Freeware, portable , tiny, perfectly fulfills single function. Not something needed daily but good one to have especially if (un)installing lots of software. Kind of pointless, isn’t it? Its definately aimed for the curious advanced-amatuer user or the sysadmin who wants 99.999% uptime. Define pointless? :) It has clear function and performs it well – unlike plenty of software. My home desktop has plenty of server-type stuff running such as HTTP share, torrent, custom RSS feeds, etc. Rebooting means I must carefully shutdown all of that (kicking everyone connected in the process) before reboot and then restart everything after. Why bother if some installer fails to rewrite single DLL or something like that? As I wrote in post it’s harldy a daily needed utility but it does save trouble of manually looking up registry entries when you need it. Hey, well I for one find it very useful. Acrobat is currently telling me I need to reboot to delete some files. WhyReboot told me which files, and I’ve just deleted them myself, no reboot required. I cleaned out the offending registry key and I can carry on with what I’m doing, no interruptions. Excellent! Many thanks for this utility! I had to install an old version of QuickBooks Pro (2001) and it kept kicking me out with Pending File Operations error. Your utility helped me find the offending files and registry key. It took a while in the registry until I searched on the actual file name (without extension) not the registry identified by the utility. I experienced the “Pending File Operations” crash when attempting to install QuickBooks 2001. The Windows XP system in question was very clean, having been newly installed recently. So the error message was a momentary puzzle…until your WhyReboot utility quickly clued me in to the residual HP-related registry entry that was the culprit! Took me a total of 10 minutes from the first QB install failure to: search the web, locate this thread, visit your web page, verify its legitimacy, download your “WhyReboot-1.0.1.537” freeware utility, install it, run it, locate the evil registry entry, squash it, and verify that QuickBooks will now install. That is testimony to the Internet at its best, and your excellent little program! Kudos, and thanks, to YOU! This is not my program, I merely reviewed it. :) Glad my post was of use and helped you resolve issue fast.